Don't let a lack of time or coding skills keep you from building a professional photography portfolio that showcases your work without distracting from it! 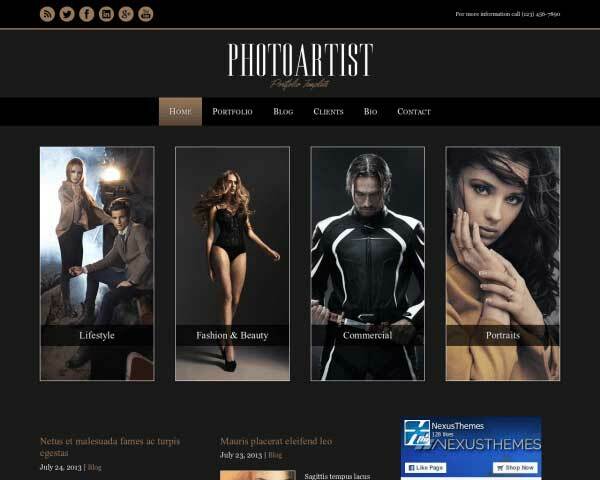 The Photoartist WordPress theme features a clean layout and built-in galleries ready to be filled with your own images. When it comes to showing the world your photography portfolio, presentation is important. 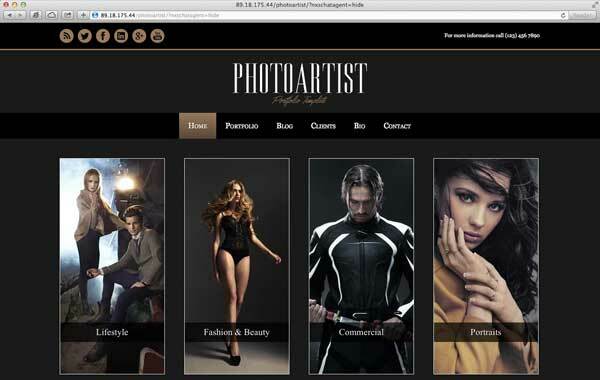 The Photoartist WordPress theme is made for photographers who want to get a professional portfolio website online fast, no coding skills necessary! 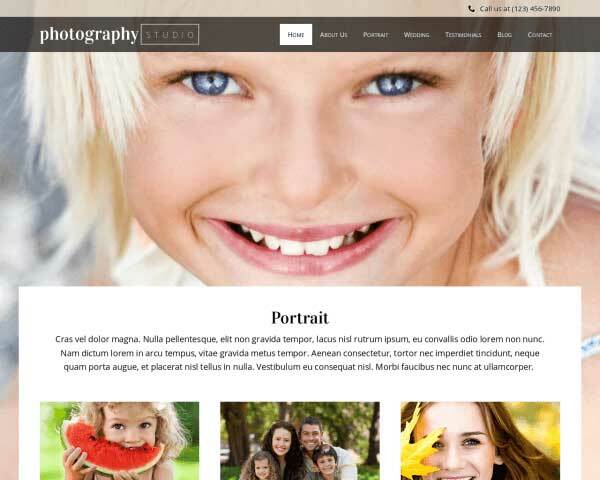 We've designed this WP template to stunningly display your photographs on any device or screen size. The clean layout of the homepage provides a neat overview of your photo galleries, latest blog posts and social media links. With multiple galleries already set up right out of the box, building a brilliant online portfolio is as simple as uploading your own photos. Pages for your client list, contact info and bio are also included to help speed things up. This theme is easily customized through our intuitive front-end editor, where it only takes a few clicks to choose a personalized color scheme and add your content. Whether your specialty is weddings, products, fashion or photojournalism, building your website with the Photoartist WordPress theme gets the job done in a snap, so you can keep the focus on your photography! Keeping your blog updated regularly can increase page views and help boost rankings.The Photoartist WordPress Theme comes with a blog, plus several sample articles. 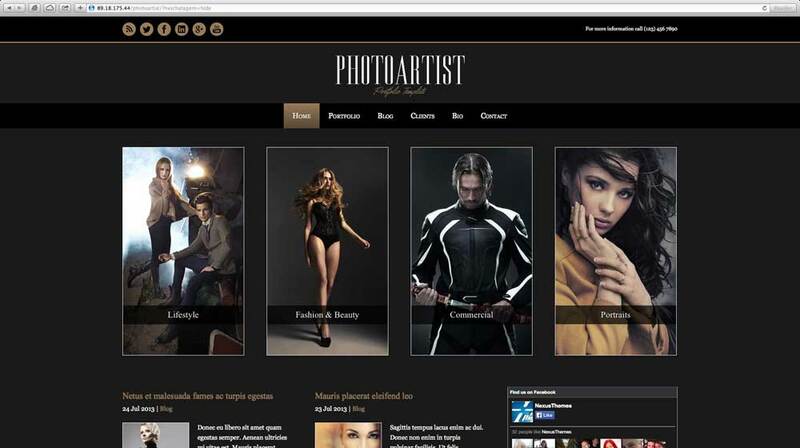 The Photoartist WordPress Theme is designed with the specific business needs of photographers in mind. Elegant design and pages for each type of service are just the beginning. 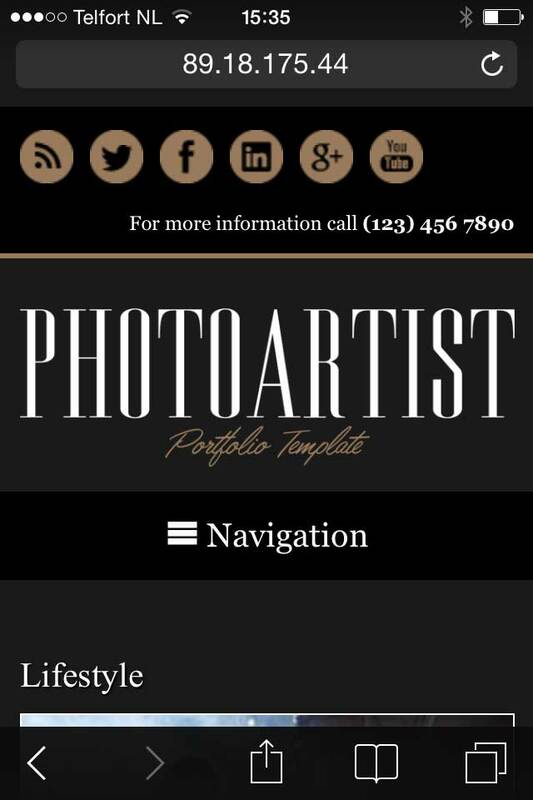 The contact page on the Photoartist WordPress Theme is set up with space for your contact details, an integrated Google map and a route planner. 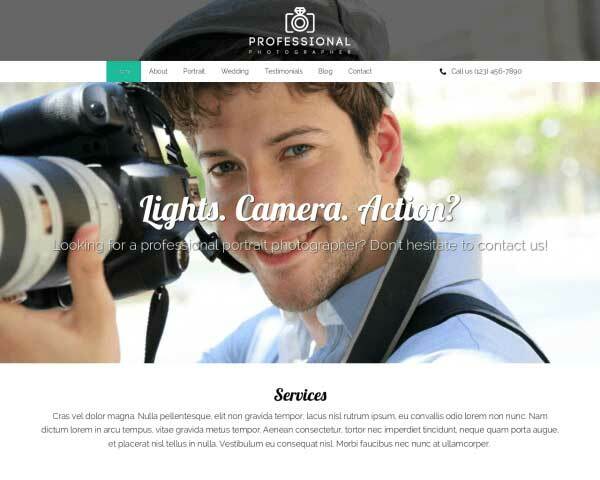 Right out of the box, the Photoartist WordPress Theme your website will have a slick, professional look and practical business features for photographer. 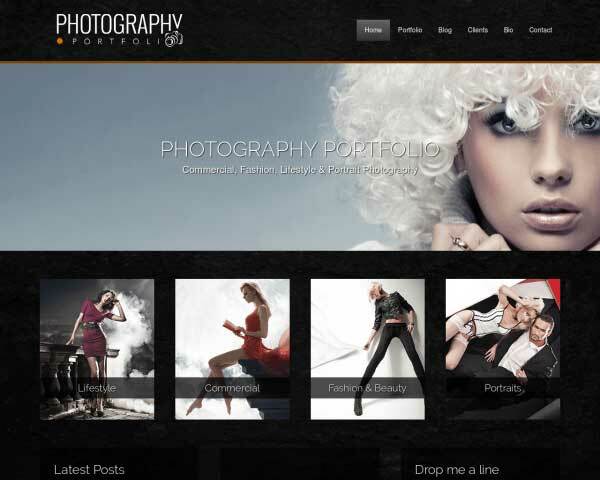 The Photoartist WordPress Theme theme provides a facility detail page of each of your facilities. Decorate the detail pages with a rich set of widgets such as texts, images and galleries. 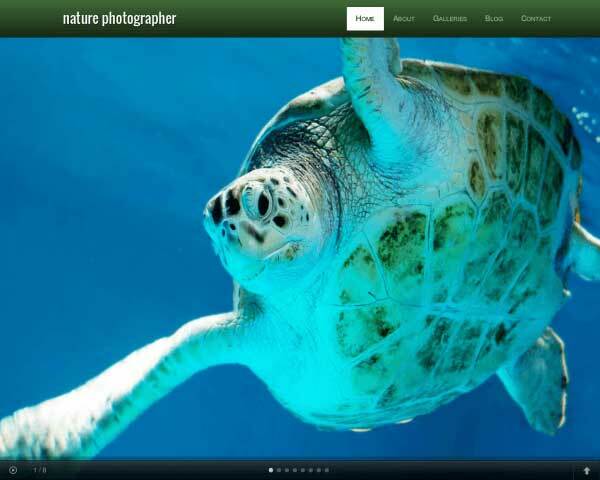 Display your photos in elegant lightbox image galleries with the Photoartist WordPress Theme. You can add multi-column photo galleries to any page or post. A very powerful way to showcase your specific skill set is with the help of a project overview. Fill in the blanks and you have your own portfolio right out the box. The homepage of this WordPress theme for photographers is designed to present visitors with an appealing overview your services along with quick navigation to more detailed pages. Take advantage of the social media options included with the Photoartist WordPress Theme to get the word out about your photography business and attract new visitors online. A great way to give your website a personal touch is to introduce your team of photographers. 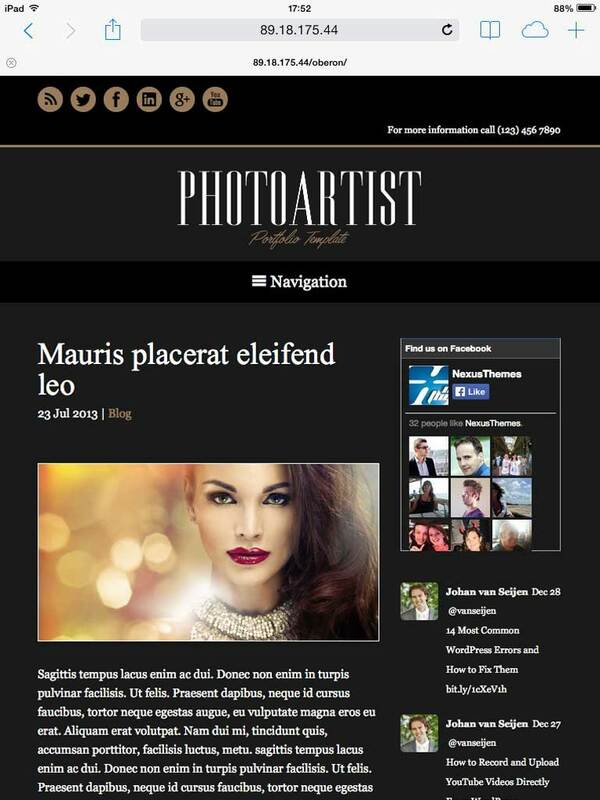 We've set up a page on the Photoartist WordPress Theme with spots for profile pics and short bios. These days people browse online using many different types of mobile devices, and websites must be mobile-optimized to look great on any device. That's why we've built the Photoartist WordPress theme to be fully responsive, automatically adapting the layout of your photography portfolio to any size screen while keeping navigation simple and user-friendly. Our sleek mobile design ensures that visitors will enjoy the same professional look and full-page photos of the desktop version when viewing your site on their phone or tablet.